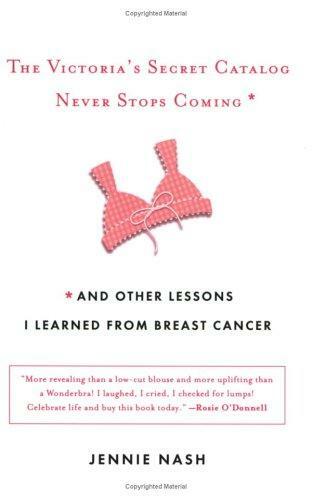 October is National Breast Cancer Awareness Month and what better way to connect, relate, and educate than through some heartwarming real-life tales of survival and commitment. Below is a mere sampling of some collections and memoirs from writers you know and love who have shared their stories. Direct links have been provided to the books available on Barnes & Noble and Amazon, but you may also find your selections at your favorite Indie Bound shop. Find your selections at your local shop through Indie Bound. I’m pleased to share this Q&A with Donna Talarico, the founder and publisher of Hippocampus Magazine. Donna earned her MFA in creative writing from Wilkes and now fills her days with writing and connecting with the literary community at large. 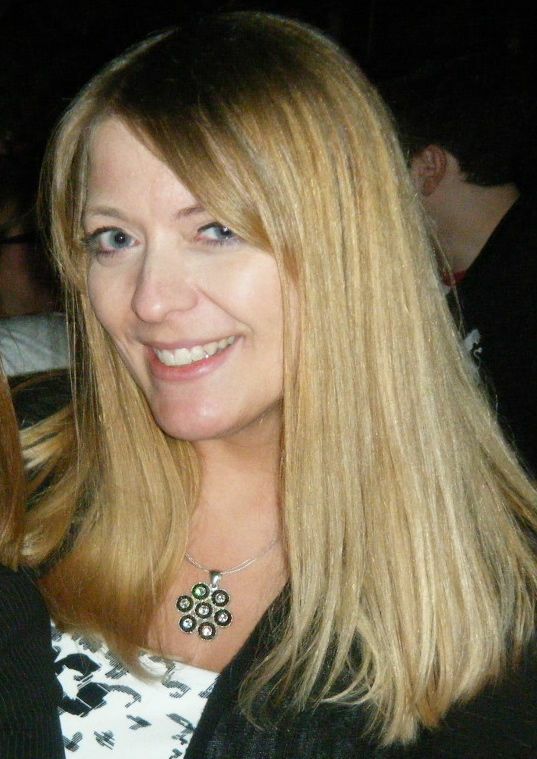 Visit her website and blog at http://www.donnatalarico.com. Hippocampus Magazine is nearly a year old. Has everything happened as you planned or has the journal taken on its own life? This reminds me. I need to plan a killer birthday party. We just launched our fifth issue and so far, so good. Way back in a previous life, when I worked in radio, I read an article about Kenny Chesney. This was in the late ‘90s. He had his first big radio hit while I was at Froggy 101, but the dude had been on the scene for years, and had about three albums to his credit before he became the tan, baseball-capped, beach bum of a stud we all love. I left radio in 2001 and Kenny has since become way bigger. But back to my point. The article talked about Kenny’s perseverance and this was his quote (probably an old saying, but this was the first I’d heard it): “Take off like a rocket, fizzle like a rocket.” I never forgot that. I announced in January, but didn’t launch until May. It could also be that I work in marketing and I know how much planning a product or event needs to be successful. Although I was enthusiastic and totally excited, I was and am very deliberate about why I do what I do, and when and how I do it. I have a lot of plans, but with time they will be rolled in. So, the short answer to this question is: yes. We’re right on track. It hasn’t grown a life of its own—instead, it’s added new life to mine. Your vision for Hippocampus included creating an inviting sphere where readers and writers would mix and comingle, where craft articles were not just about how-to but how-to-dig-deeper, and where a “a mix of timely and timelessness” would keep people coming back. What sort of response are you receiving from the literary community-at-large? What’s the gossip about Hippocampus? I am so pleased with the response Hippocampus has received since our first issue—and even before that, when we made our first call for submissions in January. When I put out the call for new staff writers and editors, I received several covers letters that just warmed my heart. It means the world to find out how excited people are about a home exclusively for creative nonfiction and how much people believe in the mission of Hippocampus, so much so that they want to volunteer their time and talent to help it grow and thrive. I also find such joy seeing the connections being made through the comments sections on the stories, as well as on Twitter and Facebook. Our most recent issue features a story, “Word,” by the fabulous Lori Myers, which celebrates the impact of words. This beautiful piece shares how one of her magazine stories—about rug hookers in a poor, Mexican town—impacted a community. The publicity from that article generated more work for these crafters. This, in turn, moved Lori; she realized how much power her words had. Now, her story about words moving her gets to move others: the comments section is filling up with praise, and writers sharing their own stories of moving experiences. There have been other examples, but this one is a great example of the kinds of conversations I hope Hippocampus can create in the literary—and greater—community. As far as gossip-gossip, I’m still waiting on the paparazzi to show up. I make sure I have makeup on at all times and, when I am participating in debauchery, I –well, actually, I usually tweet while I’m doing that. I can’t hide. You’ve added some great helping hands to the masthead, many of whom are Wilkes students, alums, and faculty. Is it hard to fight them off? I’m a lover, not a fighter, Lori! I am thrilled that people from the Wilkes program have been so interested in lending their amazing writing eyes to serve as readers and editors. Hippocampus was born (sort of) during my publishing class during the first MFA residency in 2009. I bought the domain name right after that, but sat on it for years. I was driving to the residency last January—now as an alum—and thought, “Gosh, I have been so busy with my new job that I have no answer to give people when they ask what I am doing now.” Then, during that lonely two hour drive from Lancaster County to good ‘ol NEPA, I made mental notes—no, I did not grab an envelope from above the visor and write on it while I drove on 81; that’s dangerous!—about the Hippocampus Magazine concept. I had been thinking about it for so long, and ideas don’t do anyone any good sitting in my head. When I arrived to campus—well, the bar—the first person I saw was Taylor Polites from a few cohorts ahead of me. He asked what I was up to, so I did it—I finally told someone about Hippocampus. He loved the idea. Then, I ran into my mentor, Becky Bradway; she also loved the idea and we sat and talked for a few hours about it—and other life stuff, of course. Maybe it was the winter brews and the camaraderie, but I felt major warm and fuzzies that night. The Wilkes community has been supportive in so many ways, from the encouragement when I first said something aloud to people reading and serving as editor. What’s interesting, too, is that while there is a very strong Wilkes presence, there is no underlying favoritism since all submissions are read blindly by a reading panel. Why did you opt to go this route and how has it served your purpose? Fairness has always been important to me. I’ve always rooted for the underdog. Maybe it’s because I never got picked for the kickball team, but I just do. I wanted Hippocampus to be taken seriously and I felt that, especially being new to the game, being completely transparent about our process was the right step to take. I didn’t want to prevent people whom with I may be loosely associated from submitting, but I also feared the favoritism you mention. A blind process eliminates that. Stories are judged on their own merit. However, I built into our process that we can also solicit work from published writers. Also, our craft articles, reviews and interviews are assigned. I am often quite surprised by what the reading panel collectively likes and doesn’t like—a piece that was very well-received turned out to be from a high school student. Had no idea until she sent her bio after acceptance. That’s an underdog story. I have to say that I am also very impressed by the caliber of writers submitting to Hippocampus—and the places they’ve been published. I am thrilled we are attracting established writers and equally thrilled to be a new home for people looking to get their first piece published. 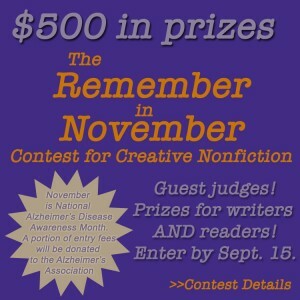 There’s still time for writers to enter the Remember in November Contest for Creative Nonfiction, with a deadline of Sept 15. How will this writing contest support the National Alzheimer’s Disease Awareness Month? How can readers and writers contribute and do some good? We’re donating $2 from every $10 entry fee to the Greater PA Chapter of Alzheimer’s Association. We have their blessing as well—they’ve helped promote the contest. Submission guidelines are on our website. 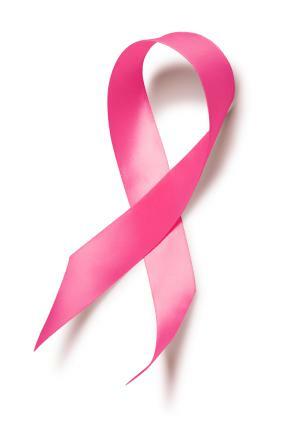 Winning entries will be published in November, which is also National Alzheimer’s Awareness Month. Some craft articles and reviews pertaining to memory will round out the winning entries. Speaking of helping out, are you still actively seeking volunteer editors and writers? What opportunities are available and what do you seek in an applicant? I’m always looking to diversify our reading panel. Like most literary magazines, the biggest audience is other writers. I do hope to attract a readership full of more “normal” people. I am looking for people who enjoy reading and wouldn’t mind reviewing and commenting on submissions when they have some spare time. So, with that one year anniversary just around the corner, what can we look forward to in the terrible twos? What does Hippocampus have up its sleeve for year two? Oh! Terrible twos. We promise to limit the tantrums and make it through potty-training without too many accidents. But seriously, I hope year two brings an increase in high quality submissions and see a continued growth in readership and interaction on our website and social media channels. With the addition of a reviews and interviews editor, our outreach to the literary community will no doubt grow. We have other things up our sleeves too. Can’t give it all away! Thanks, Donna! Visit www.hippocampusmagazine.com for submission guidelines, contest information, and—of course—some great reads! Photo note: all images obtained from Hippocampus. 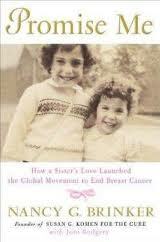 Did last week’s Q&A with memoirist/essayist Melissa Hart inspire you? 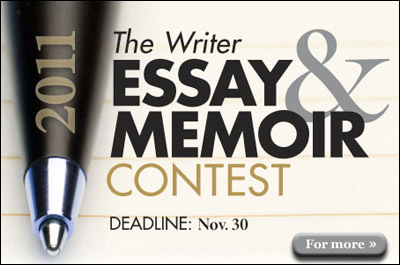 Then get your best work in shape and submit to The Writer essay & memoir contest, new for 2011! 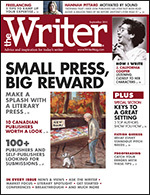 The Writer, in collaboration with Gotham Writers’ Workshop, invites writers to enter The Writer 2011 Essay/Memoir Contest with guest judge Lee Gutkind. Only original, unpublished works of 1,000 to 1,200 words will be accepted. Prizes include cash, publication in The Writer, and more! Editors at The Writer will read and judge each of the entries and select 20 semifinalists. Lee Gutkind, the finalist judge, will select and rank three winners from among the semifinalists. Lee is founder and editor of Creative Nonfiction and author of more than 20 books, including Almost Human: Making Robots Think, featured on the Daily Show with Jon Stewart. 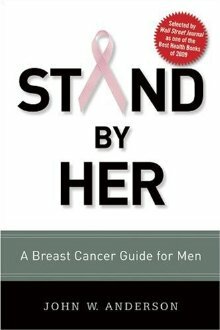 His new book, You Can’t Make Stuff Up, the Creative Nonfiction Writer’s Bible, will be published in July 2012 by DeCapo. He is editor of Keep It Real: Everything You Need to Know About Researching and Writing Creative Nonfiction. Entry fees are $10 US and the deadline is 1:59PM (EDT) November 30, 2011. Visit this link for more info and to submit your work. Go Wilkies! 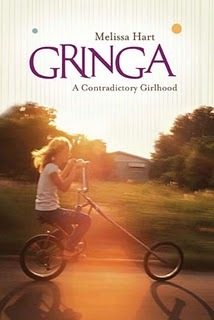 Hart is the author of the memoir, Gringa: A Contradictory Girlhood (Seal, 2009.) She’s a contributing editor at The Writer Magazine, and her essays have appeared in The Washington Post, The Chronicle of Higher Education, The Advocate, Fourth Genre, The Los Angeles Times, Adbusters, High Country News, Orion, Hemispheres, Woman’s Day, and various other publications. 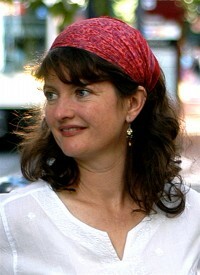 She teaches for the School of Journalism and Communication at the University of Oregon, for U.C. Berkeley’s online extension program, and for Laurel Springs School. As well, she works as an independent writing coach and editor. Visit her website at www.melissahart.com. Welcome, Melissa, and thanks for joining us. Gringa received –and continues to receive — such positive feedback. What do you plan as a follow-up? 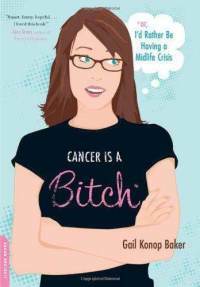 Are you working on another memoir? This summer, I’m finishing the final draft of a memoir about learning to train permanently-injured owls for educational presentations at a raptor rehabilitation center while navigating the baffling process of adopting a child. 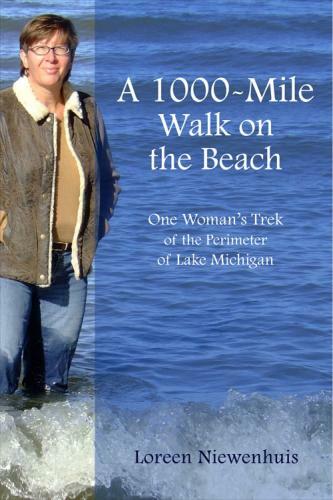 The book focuses on people who dedicate their lives to helping injured and orphaned kids and birds of prey. It’s taken me three years to write, and I’m really excited about its completion and its possibilities to bring awareness to these two demographics which actually have a lot in common! As you work on personal essays, how do you know when you come across something that might be ‘memoir-worthy’? How do you know when something has enough meat to carry a book-length theme or motif? With Gringa, I knew I wanted to investigate the under-reported phenomenon of children being separated in the 1960s and 70s from newly-out lesbian mothers. From my perspective as one of those children, I wanted to explore the effects of homophobia on families. I also wanted to examine my coming of age in multicultural Los Angeles and what it meant to grow up in such a culturally-rich environment, believing I myself had no discernable culture. I’ve written numerous short essays about my experiences with adopting my daughter and with owl-training, but I’m fascinated by how the two paralleled each other over two years, and—as I’d taken extensive notes during our adoption process—I realized I had enough material for a book-length work that expands much of my published material on both subjects. I urge participants in my writing workshops to identify a specific era and/or event from their life that has energy and conflict and revelation, and to focus their essay or book-length project on this. For instance, I’ve got a client right now working on a long essay about going to Japan right out of college to assist his grandfather one summer with some political activism, protesting a proposed naval base. He’s written about 8,000 words on the subject, but he could easily expand it with flashbacks and history and personal anecdotes to become a book-length memoir. How do you balance your time between writing and teaching? Do you ever envy those who have a ‘regular’ schedule? I spend about half my time writing, and the other half teaching. I’m just not one of those writers who can spend all day every day at the computer—I love to interact with emerging writers and talk shop and help them to get their own work published. I’ve lately started a coaching business for writers, which I adore. I’ve worked with an etiquette specialist, a woman who did search and rescue with her dog, an 85-year old world traveler, and an Americorp teacher—it’s such a fun, fulfilling job. I had a regular schedule as a special education teacher about 13 years ago, and it darn near killed me. I love the freedom to wake up at six AM and work for an hour before my daughter wakes up, and I don’t mind working like a fiend while she’s at morning preschool because I get to spend time with her in the afternoon. Often, I’ll teach at night and/or meet coaching clients on weekends. This flexible schedule works better for me than would a 9 to 5 job. I like every day to be a little different, with time built in to go for a spontaneous hike or write something unplanned, just in case inspiration strikes. With social commentary, in particular–especially if it’s for newspaper or radio–writers have to jump on a news topic as soon as it hits the wire. I’m grateful for the time I have to monitor the news with an eye for timely topics that I can then explore in a more immediate way than I approach my books and literary essays. What’s your favorite part about being a contributing editor to The Writer? I love my editors. I’ve been working with them for about 8 years, and they’re such kind, positive people. They give me wonderful assignments for my “Literary Spotlight” column, introducing me to so many innovative literary journals. My main editor, Sarah Lange, also knows exactly what types of books I like, and I’ve thoroughly enjoyed writing reviews on–for example–Priscilla Long’s The Writer’s Portable Notebook and Eric Maisel’s Brainstorm: Harnessing the Power of Productive Obsessions. You have so many diverse publications to your credit. Did you create and follow a plan for the magazines and newspapers you write for or did these publications grow organically as you discovered your areas of interest? These publications most definitely grew organically out of whatever interested me at the moment. Matching my writing to suitable publications requires research into the magazines and newspapers out there, which can be so exciting. For instance, I hadn’t heard of High Country News (one of my favorite publications) until I wrote “The Owl and I” and began to look for potential markets. I tell my students to give themselves a couple of hours every now and then to peruse the stacks at the library, and in bookstores, and to research publications online. Duotrope Digest offers hundreds of titles, of course, and I also like to Google a key word such as “owl” along with the word “magazine” to see what comes up! I write on a wide variety of subjects—among them travel, nature, adoption, LGBT issues, and Down syndrome—and I love how there’s a publication out there to fit even the most specific essay and/or article. By the way, I’d like to emphasize for your readers how open the editors of newspaper commentary sections are to topics and writers from all over the country—for instance, as an Oregon writer, I’ve had commentary published in The Los Angeles Times, The Chicago Tribune, and The Washington Post. Editors are always looking for fresh perspectives and voices on topics which affect readers in all parts of the country. You often find unique ways to bridge similarities between animals–owls, cats, raptors–and humans. Have you always been an animal lover? How has your relationship to animals fed your creativity? This is a terrific question, and one I’ve never been asked! I’ve had cats since I was three years old—the first, a mammoth beast named “Butch” whom I loved almost as much as my little sister. I’m happiest outside, watching animals in nature, or playing with my cats. Ten years ago, I sold my first travel article to Cat Fancy, after visiting a feline sanctuary in Rome, and I’ve been writing off and on about cats (and sometimes my two dogs) every since. It’s interesting to note that my husband and I met at the dog park . . . three years before the romantic comedy Dog Park hit the screen. Volunteering at the raptor rehabilitation center inspired numerous essays. I’d never been around birds of prey, and getting to feed them and care for them–and later, glove train them—was such a privilege, every single day. I thoroughly enjoy getting to revisit those years in the memoir I’m working on now. One of the things I tell workshop students on the first day is “identify your passions.” Then, you can brainstorm whom you might profile in a magazine related to these passions, and what related essays you might write, and what books you might review. For instance, I’ve got a student fascinated by VW busses, and he’s written articles, essays, profiles, and blog posts on the subject for a couple of years. As soon as freelance writers get in touch with what they love, they can take a cross-genre approach which keeps their work exciting and relevant. With fall just around the corner, how do plan to take advantage of the remaining weeks of summer? Anything left on your summer reading list you’re excited to share with us? Oh, my summer reading list. Between parenting, working on a book, teaching a community-based class and working with coaching clients, it’s a miracle if I get to open The New Yorker. But I’m on a huge Mary Karr kick right now, reading her work backwards from Lit to The Liar’s Club. I just reviewed Sarah Rabkin’s superb book of essays, What I Learned at Bug Camp, for High Country News, and I’m looking forward to reading John Daniel’s newest book. I’m kind of hoping children’s author Kevin Henkes will come out with a new picture book, too. I’m in love with his mice. Speaking of books, what’s the one book that you turn to repeatedly for an extra boost of writer’s self esteem? What’s the book that kicks you in the pants when you need it most? J.D. Salinger’s books—the three that aren’t Catcher in the Rye—ground me and remind me of who I am and what I want to accomplish as a writer. Aside from his story, “Seymour: An Introduction,” there’s little in them about writing, per se, but they’re informed by marvelous characters, compelling dialogue, subtle plotlines, and a great deal of Eastern philosophy which I try hard to practice in my daily life. 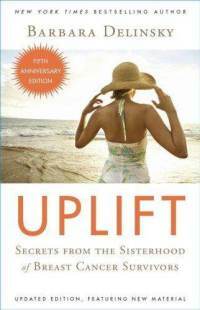 Jack Kornfield and Jon Kabat-Zinn are my contemporary go-to authors, and all I have to do when I’m feeling unbalanced and confused about my work is to read a few pages. By the way, Kornfield says in one of his audio lectures, “What is it time to do with that which you have been given?” I urge freelancers to write this question on a sticky note and attach it to the computer. As someone who’s mainly self-employed and juggling several jobs in a day, I repeat it to myself almost every morning. It helps. Visit www.melissahart.com for news and upcoming events.